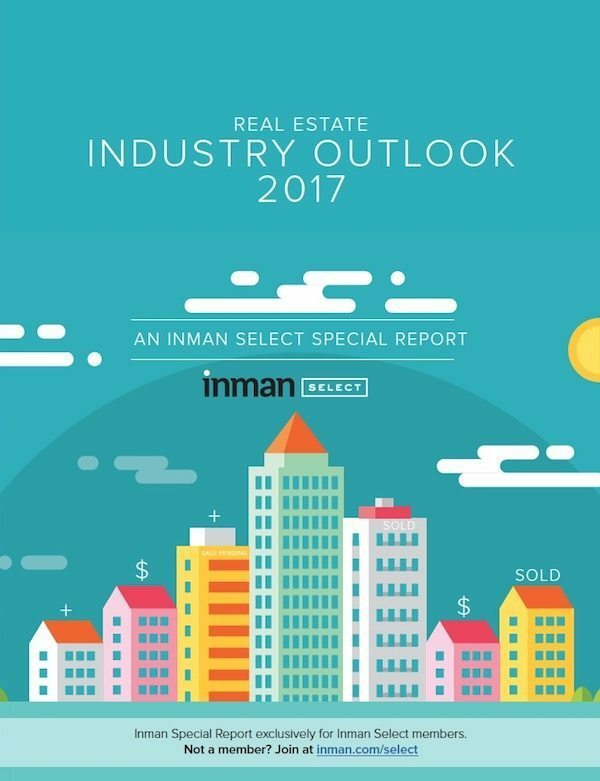 Special Report survey respondents and some of the industry’s top executives were nearly unanimous in believing 2017 will be another strong year for real estate. The first quarter especially is expected to start with a hiss and a roar as buyers and sellers hasten to make a move now that the election is over and interest rates have undergone the first in a series of rises. Overall, 2017 will be an unorthodox, non-traditional and unpredictable year, both nationally and globally. Those who are nimble will manage it best. “What most people think they know about real estate will have to be re-educated. Low interest rates will no longer be the driving reason for home purchase, building personal wealth and stability will,” said one respondent. Those surveyed for the 2017 Outlook Special Report expressed the hope that higher interest rates might free up inventory as more buyers and sellers, previously holding back, are galvanized into taking action due to the new market conditions. 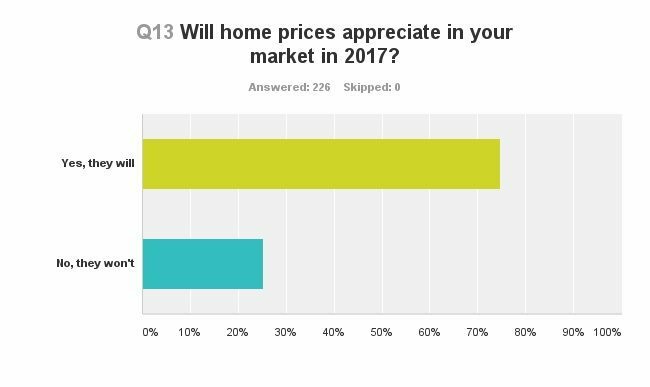 Thanks to the momentum driving the housing market — good employment, rising salaries, high-earning millennials with an interest in homeownership who are unhappy with high rents — our research found there is good optimism about the housing market in 2017, with 27.43 percent of respondents saying they are extremely optimistic and a further 45.13 percent describing themselves as somewhat positive, while 11.95 percent are ambivalent. 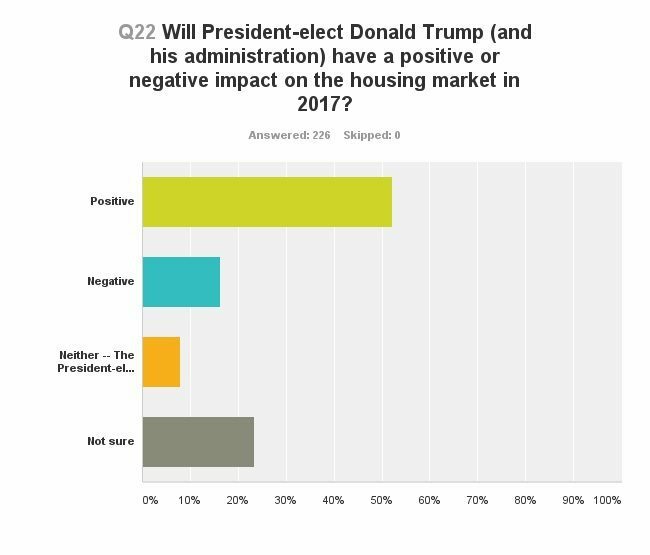 Meanwhile, more than half of this survey’s respondents (52.21 percent) expect President-elect Donald Trump to have a positive effect on the U.S. housing market. They are looking to Trump to ease regulations and to look after an industry he knows well. A common sentiment expressed by respondents was that because Trump has an understanding of real estate, he will be reluctant to harm the industry. “I am going to remain optimistic. Trump likes real estate so I hope he makes the conditions conducive for our industry to succeed,” said one respondent. 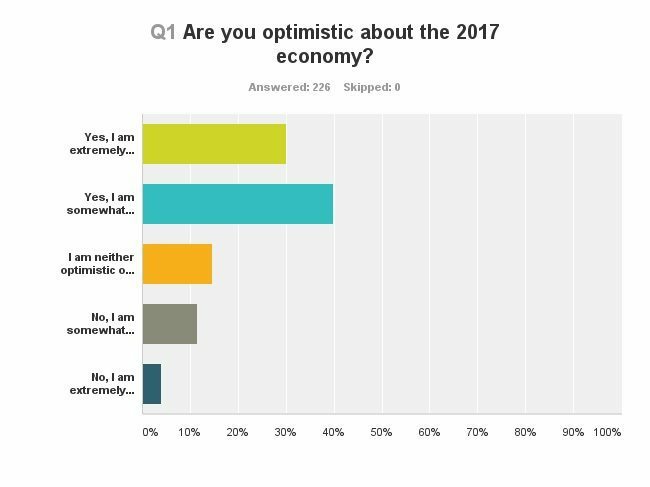 Our survey found that almost 70 percent of those surveyed are optimistic or somewhat optimistic about the economy. 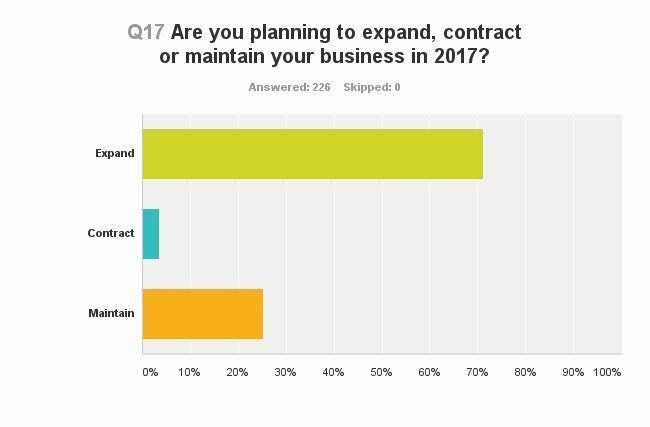 As a result, a strong majority (71.24 percent) of respondents have plans to expand their businesses next year. 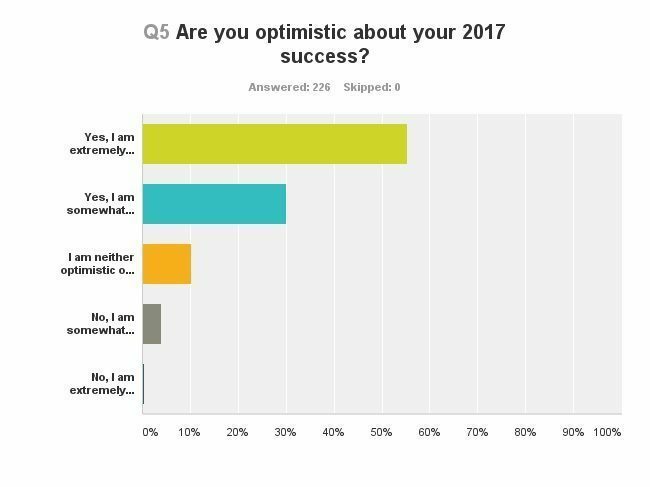 More than half said they were optimistic about their own business, with more than 55 percent extremely happy with the way their business is heading into 2017 and a further 30-plus percent somewhat happy about the outlook. 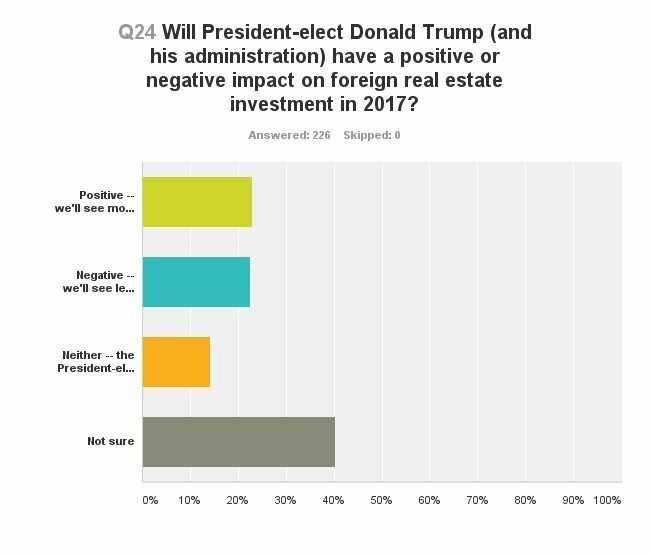 And while respondents felt that Trump, with his real estate development background, would be good for the housing market, they were less sure about what a Trump presidency might do for foreign investment in the U.S.
Our research found that 23.01 percent thought he would be positive, 22.57 percent thought he would be negative and a further 40.27 percent were just not sure. “It depends on what he does. If he clamps down on the international investment portion of real estate, mainly Asia, it will impact the markets with a large influx of Asian investors. They will pull their money out of the U.S. and take it to countries that are more welcoming,” said one respondent. The seeming isolationist stance taken by the incoming President is not going to do the American market any good, added one San Diego respondent. As well as polling our readers, we also went to the heads of some of the country’s top real estate companies for their expectations on 2017 to see how they tallied with other respondents. Still, a decision either way was good news for real estate, putting people in a position to make housing decisions again, industry heads concluded. Howard Hanna president Hoby Hanna said there had been an uptick already in activity since the election, which he sees continuing. “Whether it’s the result of a Trump presidency or just the end to the divisive election, we’ve seen an increase in consumer confidence and buyer activity on the high end, which had come to a standstill through the summer and early fall,” he said. “And with a double-digit increase in new sales activity for November and so far in December, we believe this consumer confidence will carry through the first quarter of next year and create a great start to 2017,” he added. Another positive effect of a Trump presidency might be boons for construction, said Windermere Real Estate president O.B. Jacobi. “The Trump presidency may also remove some obstacles for builders in the form of tax breaks and state incentives that limit regulations and encourage additional lending. Since an estimated 25 percent of the cost to build a home is considered ‘regulation,’ these changes would presumably help builders and consumers,” he said. One possible downside to the big infrastructure projects that President-elect Trump has talked about in his campaigning is that it could cause a labor shortage for construction companies, said one survey respondent. Our respondents and the chief economists of two large brokerages were united in the belief that unit sales and prices would go up in 2017. 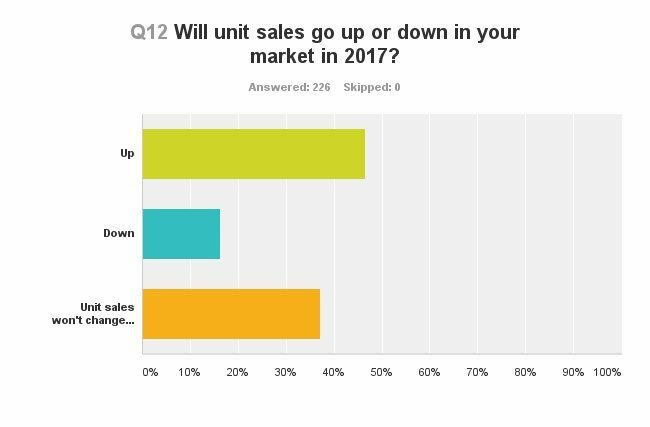 Nearly 50 percent of respondents to our survey felt that unit sales would go up, while, 37.17 percent didn’t think the number would change and 16.37 percent said they would go down. Almost 75 percent of those surveyed thought that prices will go up next year. Windermere’s chief economist, Matthew Gardner, believes existing home sales should rise to 5.548 million units in 2017. He is also forecasting that existing home prices in 2017 will rise by 4.5 percent to a median of $242,700. Pacific Union’s chief economist, Selma Hepp, also believes house prices will continue to rise, especially in markets that are already supply-constrained. “Supply is still the largest contributor to continued elevated price appreciation since inventory of homes for sale remains at historical lows,” she said. Hepp added there was the possibility of a very hot market in the next few years if certain elements fall into place. She said she would watch to ensure mistakes from the last housing crisis are not repeated, especially when it comes to alternative mortgage products and mortgage-backed securities. 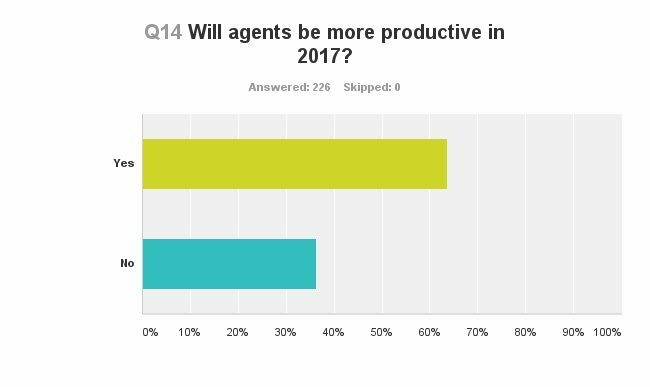 We asked respondents how they saw agent productivity progressing in 2017, and almost two thirds (63.72 percent) said agents would be more productive in 2017. It will be a year when successful agents will have to work for their business, said one L.A. respondent. McLaughlin said he was expecting to see a rise in productivity of his agents in 2017, but that the industry as a whole would be seeing decreasing productivity. Technology will be an important tool for improving agent productivity in 2017, said the industry heads. “Technology and big data will continue to have a major impact on agent productivity in 2017,” said Coldwell Banker CEO, Charlie Young. “Our most innovative sales associates are experimenting with virtual reality in their open houses, meaning soon they can show multiple listings to multiple people from one location,” he added. More tech innovation is expected in 2017. On Keller Williams’ Chris Heller’s wish list is continued innovation in artificial intelligence (AI) and virtual reality. There are still those out there doing it their own way without the help of social media. Some respondents are watching their local MLSs to see how they pick up on new opportunities. “Technology is changing our industry fast. My biggest fear is that my MLS won’t play ball with [Broker Public Portal] and Upstream. I want to be ahead of the curve with the way search is changing. I hope that we do move towards a national MLS,” said this Chapel Hill respondent. There is still a lot of “what’s that?” confusion about BPP and Upstream among agents, we found in our survey. 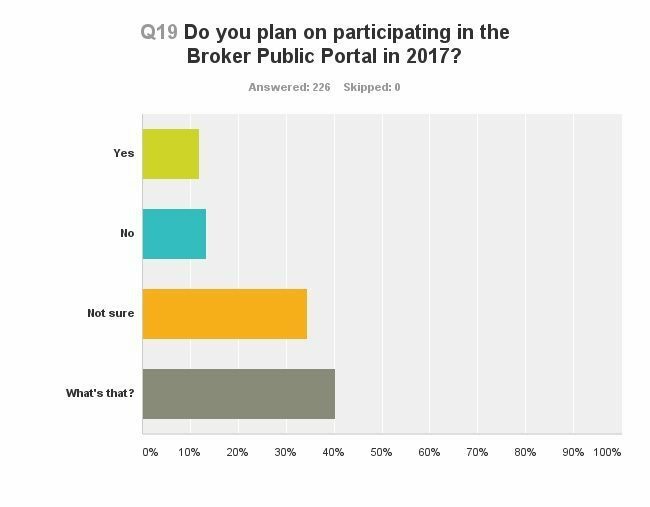 More than 40 percent of respondents (Q19) didn’t know what BPP was, and 35 percent were mystified by Upstream. Several of the companies we talked to, including Pacific Union and Keller Williams, were on the boards of BPP and Upstream and excited about what they would mean for the industry. 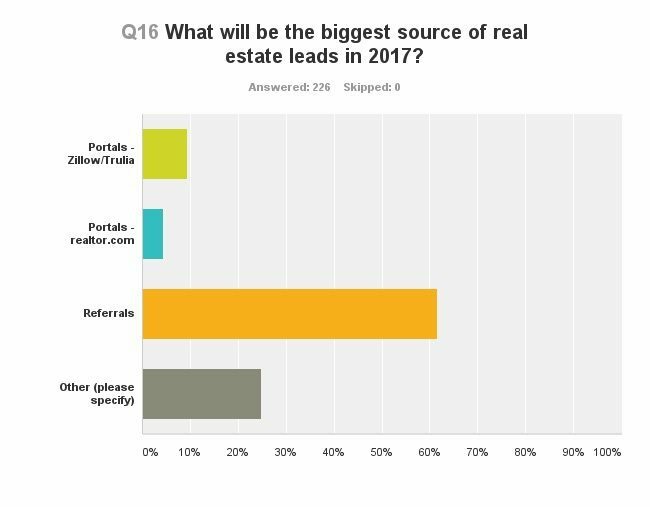 We asked respondents where they believed their leads in 2017 would come from, and the majority said referrals (61.5 percent) with 9.29 percent saying from Zillow and 4.42 percent from realtor.com. Young added, “Our biggest source of leads in the coming year will be our new digital platform, Zap, which Coldwell Banker has been actively rolling out for its brokers, agents and consumers.” Zap is a tool that generates leads by connecting agents with prospective homebuyers in their area. Yannaccone addressed how real estate businesses should operate during the initial uncertainty of a new Trump government in 2017: “One thing that is for certain as we enter into 2017 is that there will be a great deal of change as the President-elect challenges the status quo,” she said. Rising interest rates should not be viewed negatively, she said. On the other hand, there will be potential move-up buyers who are locked in at historically low rates and who may be unwilling to take on a mortgage for a new home at a higher rate, thereby impacting existing home inventory levels, she added. It’s important for agents to stay calm and keep doing what was working for them, said Heller. Heller was sanguine about the upcoming change of government. Hanna allayed any fears that rising interest rates would change the market as long as they are kept to a certain level, which the Federal Reserve is proposing at this point. “Interest rates would have to go to 6 percent to see a real slowdown in the market. Taking that into consideration, fear of interest rates increasing should drive at least the first half of the year in tremendous sales activity,” he said. Heller added that this expected activity in a changing environment will be a great opportunity to advise clients and share their market expertise. One of the prevailing themes coming through in our research is that well-educated agents will be worth their weight in gold to their clients as they help them read fast-changing markets. One respondent emphasized becoming better informed: “I’m concerned about keeping on top of providing my clients with the best and most timely information and counsel. I plan to increase communication with my lenders and add to the variety of the lending programs I’m familiar with working with. “I will be keeping buyers apprised of what’s happening,” said this respondent, who covers the Virginia and North Carolina markets. And on the other hand, “I might be possibly getting sellers to accept price adjustments due to buyer hesitancy,” said a San Diego respondent. Yannaccone said, “It is important that as an industry we focus on educating buyers about perceived barriers to homeownership and providing alternative solutions to assist them in achieving their goals. “No change occurs in a bubble; any movement in rates and the subsequent impact on housing occurs in conjunction with other economic factors, such as whether income levels throughout the country are growing or not, whether credit restrictions are loosening, for instance,” she added. According to Hanna, Howard Hanna is aggressively going after buyers, with a lot of education on buying versus renting and explaining how an increase in interest rates will impact buying power. Jacobi is expecting a rise in first-time homebuyer activity in 2017. “While we’ve seen some improvement over the past year among these buyers, I think rising interest rates will encourage even more of them to jump off the fence and into homeownership,” he said. Though politics has had everyone transfixed this year, Hepp reminds the industry that it’s the economic factors that are driving the largely buoyant real estate market as it goes into 2017, not anyone in the White House. “The housing market is on its own path,” she said. From a markets and economics point of view, there is little doubt that the uncertainty people are feeling could have an impact, said Hepp. “In the very least, I’m concerned about what higher uncertainty and volatility does for consumer and business confidence,” she said. What are real estate professionals worried about? Despite the overall optimism, no one is expecting next year to be without its surprises — and some of these could impact the lives of real estate agents. What are respondents worried about? Heller said he would find it worrying if interest rates went up too quickly, and he is joined by other respondents. A combination of high interest rates and low inventory would not be welcome, said one respondent. Affordability remains a concern especially in the hotter markets, said others. A mercurial federal monetary and housing policy or loose lending would be worrying too, added another respondent. Then there are elements out of our control — global market incidents or terrorist attacks, said another. The Trump presidency could coincide with some big changes in the industry, which smart agents will respond to quickly, suggested one respondent. And not all buyers around the country are going to move on homebuying; some may hold off because they are unsettled by the new man in the White House. When asked what the biggest challenges would be in 2017, respondents listed rising interest rates, low inventory, helping their clients find affordable homes, the changing commission structure, finding leads and recruiting as aging agents leave the industry, among others. Some around the country are already seeing the signs of an easing market and are starting to think what a next recession might look like after 2017. To sum up, it looks like it is going to be a productive 2017 — but you would be wise to make the most of it and get off to as strong a start as possible in the New Year. Agents and brokers will have to work smarter in 2017 and roll with the punches. “2017 will be an unorthodox, non-traditional and unpredictable year both nationally and globally and those who are nimble will manage it the best,” said another L.A. agent. “I think this is going to be the last boom year of the recovery. I think 2018 will be slower and the election honeymoon may be over,” concluded a Florida respondent. Inman conducted the survey between Dec. 1 and Dec. 11, 2016. There were 226 respondents.